Since I am leaving for Mongolia tonight, I thought I share with you a unique vodka experience. 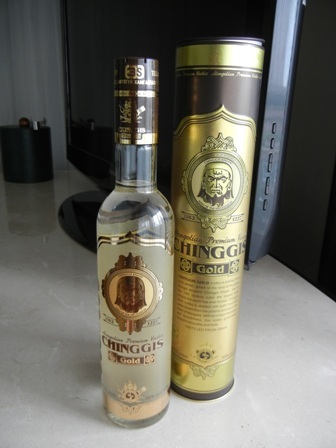 Chinggis Kahn Vodka especially the Gold brand is a great drink. It is the leading vodka brand in Mongolia. After a meat rich meal and even without any food (but preferably after dinner), Chinggis Gold is just a treat. This vodka is produced from high-quality, domestically grown wheat, and mountain spring water. Because of the very special distillation process (8 distillations and filtrations through quartz-sand and silver birch activated-carbon) it has an extremely fine taste and a very smooth palate. 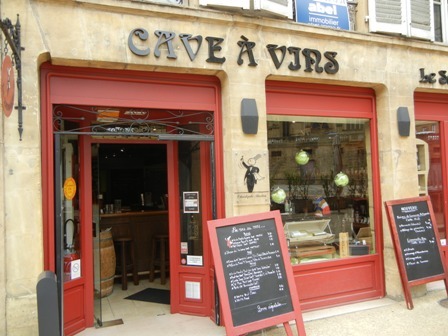 Some of you might know my favourite wine bar. It is “Weinstube Kesselstatt” in my home-town Trier. Every time I visit the place of my birth, I also visit this wonderful place. I just love to sit in its front garden and look at the two churches, and the other surroundings, watch the people passing by and enjoy being alive, and home. 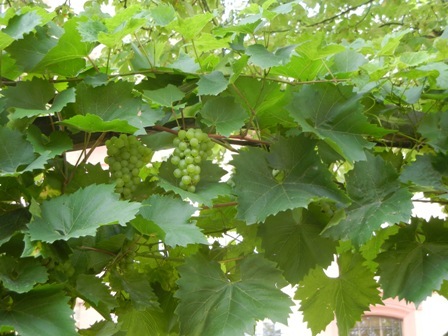 In summer and autumn the leaves of the vines are green and later full of colour, and the vines bear grapes. It invites to think about times gone by and times to come. Reminiscing (or in a German dialect ‘simmeliere’) about the past is a privilege of the ageing cohort. Enjoying the results of hard work in vineyard and winery is something shared by all, it goes beyond the borders of biology. My tip: try the Pinot Noir. All the Rieslings on offer are excellent but last time I tried the Pinot, and that was marvellous. It is a paradise this wine bar. 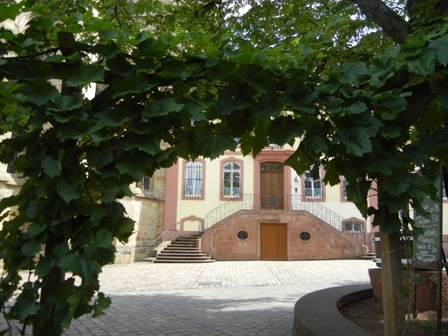 When in Trier do not forget to visit Weinstube Kesselstatt. I have written about the wines produced by Jean-Pauls Vineyard near Yea, Victoria earlier. August is a special month anyway since it carries my birthday, and I needed to be spoilt somehow. That is why I opened one of “my treasure wines” the other day. Wine bottles are heavy and one cannot carry many on the plane. Moreover there are customs regulations which somehow limits further the number of bottles on can carry. Believe me it is not easy to decide which bottle to take on the plane. 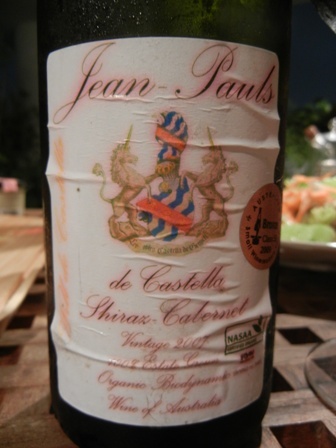 But we brought this bottle of ‘2007 de Castella Shiraz Cabernet’ by Jean-Pauls Vineyard. William de Castella is one of our neighbours so to say. His Jean-Pauls Vineyard is situated near the pcituresque country town of Yea, about a 30 minutes drive from our farm in Glenburn. Will is also a member of our association, the Upper Goulburn Winegrowers Association. Will de Castella started his operation in 1994. From about 6 acres under vines he produces only 200 cases a year, a tiny amount in comparison to much larger family and industrial operations. His vineyard is organically certified and produces exquisite fruit. I just love boutique vineyards and wineries since the passion of the people behind the operation directly transpires into their wines. The de Castella family carries a famous name, Will’s ancestors where the pioneers of the Yarra Valley and the Victorian wine industry in the 19th century. I love his fruity and delicate wines which are well balanced and just a delight. This blend of Shiraz and Cabernet combines the strength of both varietals. So this wine made my day after a busy and stressful day in the office. We had it with food, of course, one of our customary family meals which are so enjoyable. If you should visit Victoria, please take a day and drive up to Yea and check out some of the wineries along the way. You will not regret it. 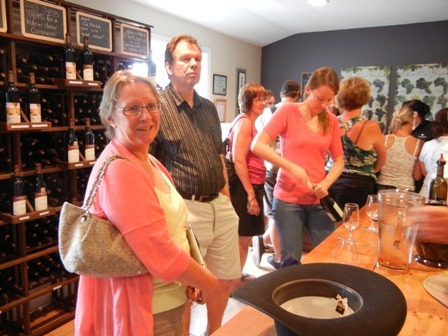 We were pressed for time when visiting the Niagara peninsula area. 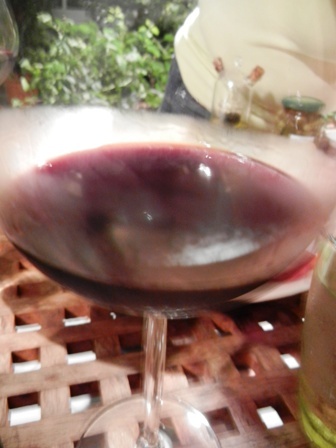 Therefore, we decided to visit only one winery. 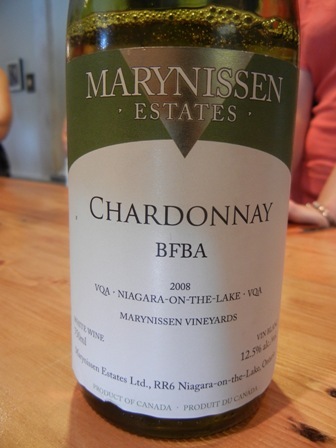 Our choice was Marynissen Estates, situated in the Niagara-on-the Lake wine region of Ontario. 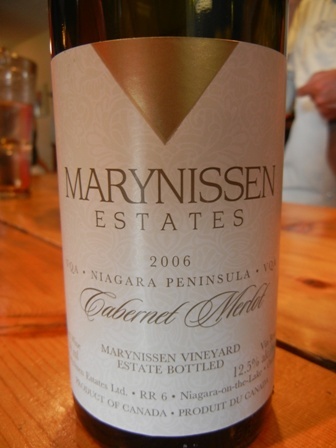 Marynissen Estates was founded by John Marynissen who came to Canada from Holland in 1952 and started growing grapes with his wife Nanny in 1953. Since 1990 the winery is up and running. John was one of the pioneers of the Canadian wine industry. He was renown for his wine-making skills. In 1978 he was awarded the title “Grape King”. 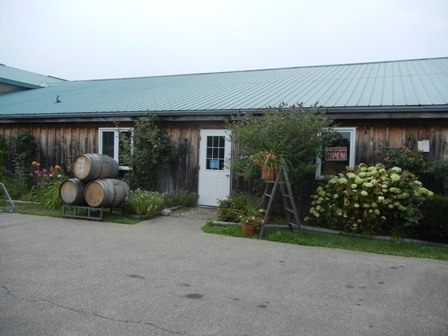 John was the first to plant Cabernet Sauvignon vines in Ontario. His daughter Sandra encouraged him to invest in a winery. 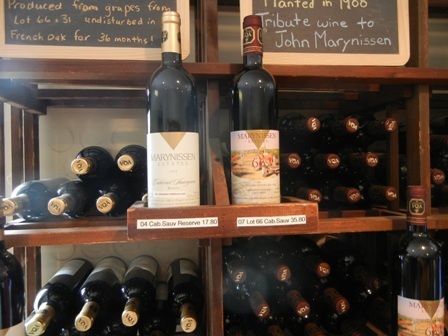 In 1996 and 1997 Marynissen Estates won awards for the best red wine. Today, Sandra continues the family tradition. The cellar door is located in an unassuming shed. 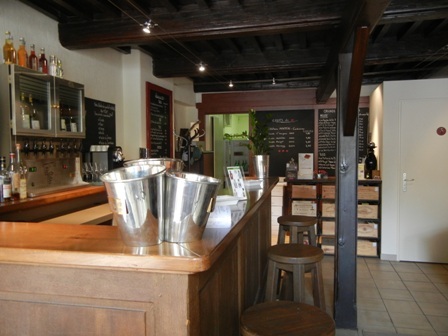 When we entered the tasting room it was buzzing with customers. We were served by a nice young lady, Ellie was her name. She was very friendly and efficient and helped us find our wines. We started tasting a flight of white wines. 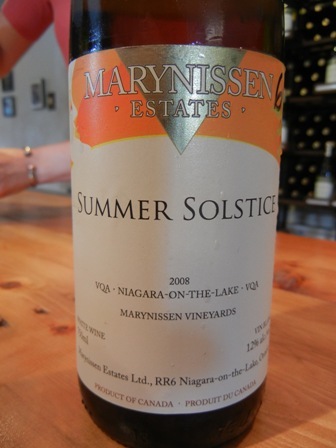 The whites included the Marynissen 2008 Summer Solstice, a 2008 Riesling and a 2008 BFBA Chardonnay. 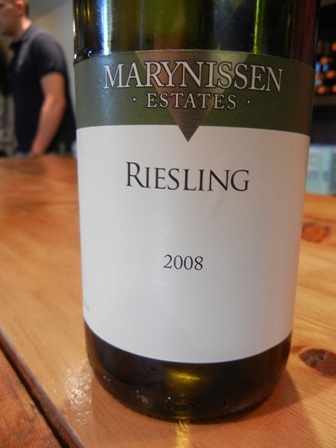 Dominik just loved the Riesling and decided to buy a case to take it home. We were constrained because we had already six bottles in our luggage to bring home to Germany and felt a bit uneasy. Riesling could not be my choice anyway. 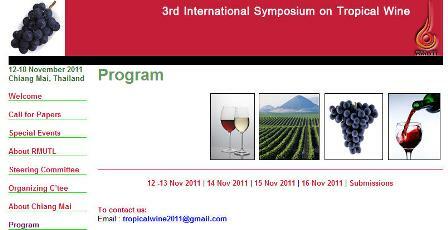 We were heading to Trier, Mosel, to Riesling heaven so to speak. We decided not to take owls to Athens. This wine is an interesting blend of Gewuerztraminer (50%), Riesling (30%), and Chardonnay (20%, not a very common mixture of grapes for a white wine. We also tasted some of the red wines. I loved the Cabernet Merlot blend and the Syrah of which we bought a bottle to take home. Around the cellar door are some of the Marynissen vineyards. I immediately noticed the “strange” way the vines are pruned. 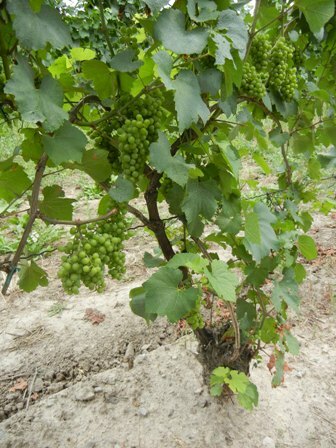 I had learned earlier that in some parts of Ontario the vines are buried in the ground during the cold winters. This is of course very costly and very labour intensive. The year old canes are covered with soil and in spring dug out and clipped back to the trellis. 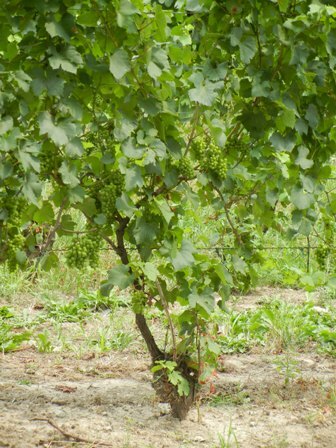 The “head” of the trunk of the vine which in Australia is about one meter from the ground, is located right above the ground in Ontario so that it can be easily covered by top soil in winter (also called “hilling”). 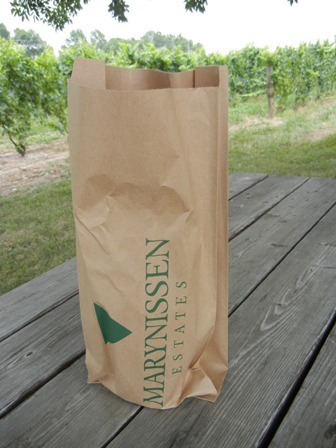 Marynissen Estates is a great place to visit. 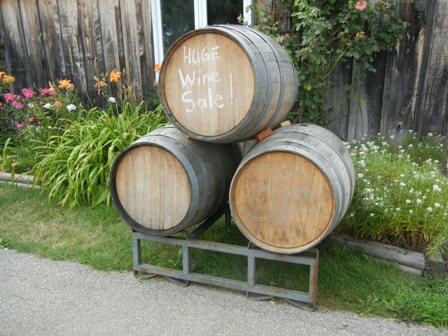 I highly recommend it to anybody wanting to explore Canadian wineries and vineyards. 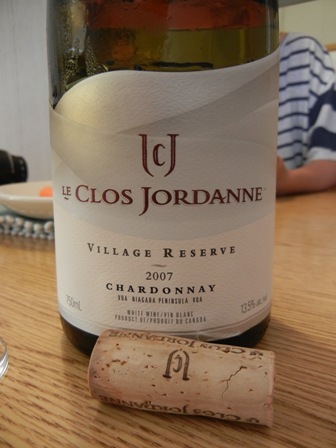 One of the best Chardonnays I drank while touring Ontario, Canada was the ‘2007 Le Clos Jordanne Village Reserve Chardonnay’. I bought it in a bottle shop in Ottawa, a very interesting capital city, where we had a great time. 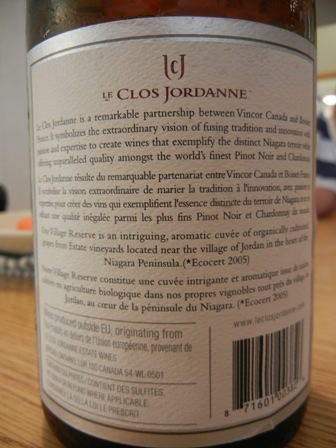 Le Clos Jordanne is a kind of joint venture between the old and the new world wine industries, a partnership between Vincor Canada (a Constellation company) and the Boisset family of Burgundy. 130 acres under vines is not a small investment either. 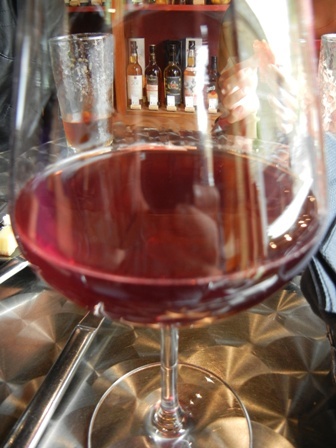 Only Pinot Noir and Chardonnay wines are produced. The village reserve Chardonnay is a cuvée of organically produced fruit from three vineyard locations. I liked its zest, the fine acids, its creaminess, the good structure and the long finish. Boy did we enjoy this elegant drink with our seafood pasta. 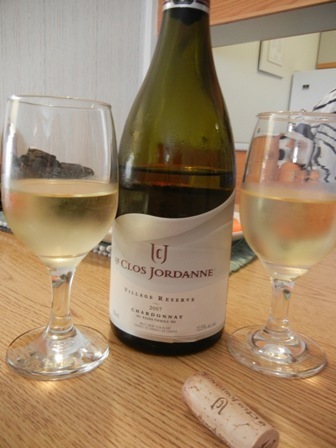 At our last day in Ontario we visited the Niagara falls and passed Le Clos Jordanne but had no time left to drop in and taste some more of their wines because we had to get to the airport in Toronto. What a shame. We’ll do it next time. One of the good things when in Trier is that one is very close to Luxembourg and France. Both countries are ideal destinations for day tours. It was a cloudy day when we set out. Our first stop was at Nennig where we visited the Roman villa with its fantastic tessellated floor. 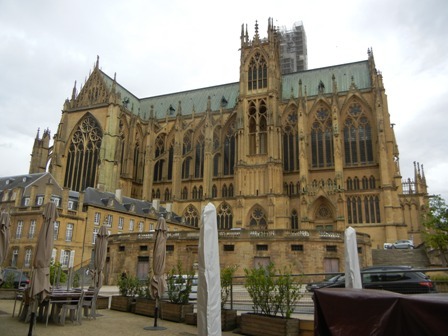 When the weather changed and the sun cam out, we spontaneously decided to continue our tour and visit Metz, the capital of the Lorraine region of France, just about an hour from the German-French border. My last visit to this historic and picturesque town was when I was at the gymnasium, about 40 years ago. Because I belonged to the “French branch” of my high school, and French was our first foreign language, school trip brought us regularly to neighbouring French regions. My family had never been there, and of course Metz is also situated at my beloved Mosel river, and French vintner produce good wines as well. When another rain shower surprised us during our city walk, we found refuge in a wine bar which we had spotted earlier; Le Sommelier, it was called. 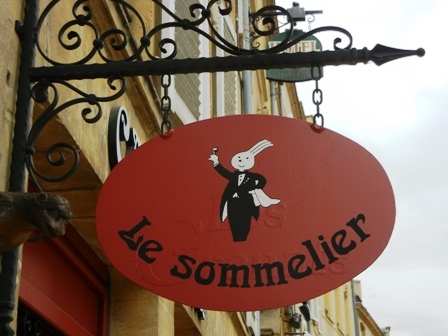 While writing this blog entry I learned that Le Sommelier gets extremely good ratings in trip advisor which doesn’t surprise me at all. The service was just excellent. The lady behind the counter was very friendly, rearranged chairs and tables to accommodate the four of us. The children had soft drinks and we adults embarked on a tasting of Moselle wines. We were also served a platter of various cheeses and cold cuts, delicious stuff. 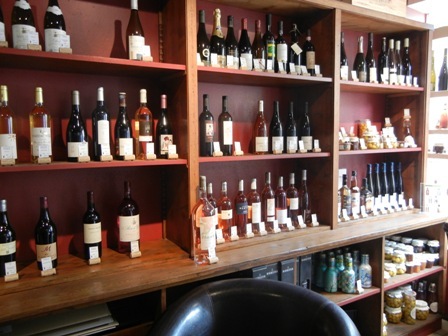 The wine list if short but there are many more bottles on the shelves which one can buy. 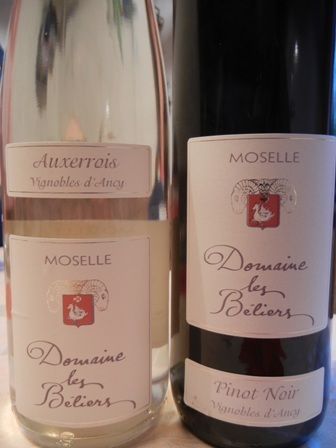 We settled for two wines by ‘Le Domaine les Béliers’ in d’Ancy-sur-Moselle, Moselle. 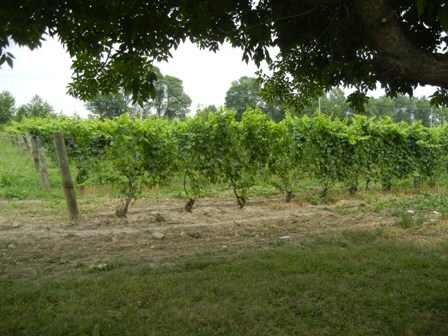 The Maurice family is working the vineyards at ‘Domaine les Béliers’ since 1650. The total area under vines is only about 4 ha. This is a small vintner to my liking. 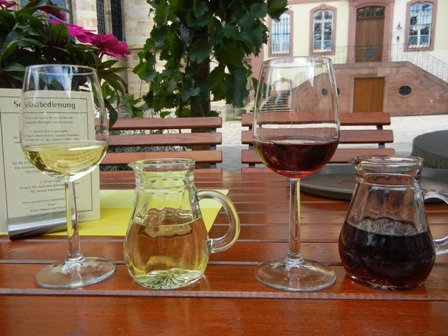 The main varieties are Auxerrois, Pinot Noir, Gamay and Pinot Gris. No Riesling, as the Riesling lovers will notice. We tasted the Auxerrois and the Pinot Noir, which we liked best. Needless to say that we bought some bottles of these wines. More about the wines and the winery another time. 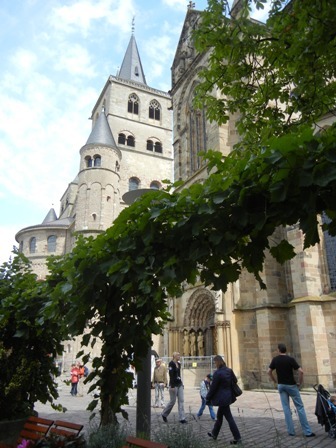 Visit the cities of the Moselle/Mosel Metz, Thionville, Trier and all the rest. Its truly worth it. You are currently browsing the The Man from Mosel River blog archives for August, 2011.